We have known for some time that Audi is planning to cut the roof off its brand new 2015 Audi A3, as they have done in the past. 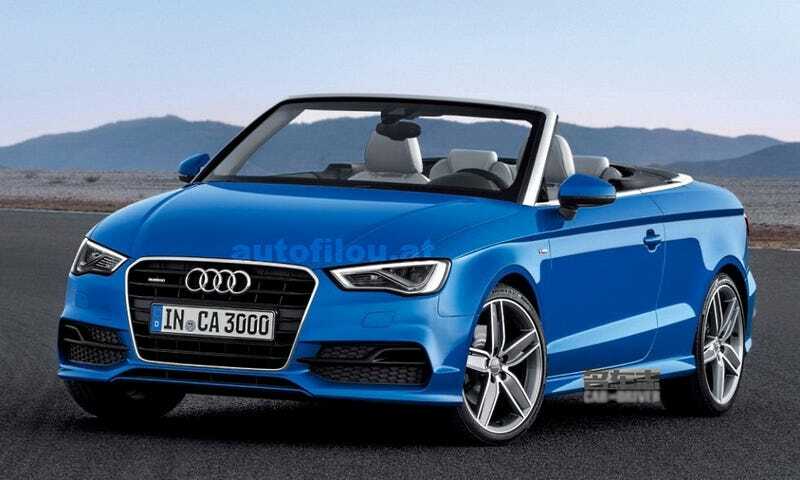 This morning we received what are purportedly leaked press photos of the new A3 Cabriolet. Is it the real deal? We're not sure. A few of the images showed up on Austrian autos website Autofilou this morning. They certainly seem legit at first glance, sharing the curves, grille, headlamps and other details with the new A3. It's a great-looking 'vert if it's true. But that blurred out Car and Driver watermark between the wheels makes me doubt their veracity. Check out these C&D renders of the same car from a little while ago. They look kind of similar, don't they? So right now, we aren't sure if this is the real car. We are expecting it to debut at the Frankfurt Motor Show next week though. What do you guys think?